Only available by special order and depending on quantity at least 3 days required. 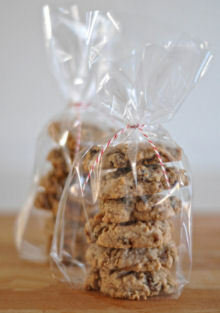 Available flavours are Chocolate Chip, Fudge and Oatmeal Raisin. All bags come sealed with a sticker, if you want ribbon, add 35 cents to each bag. Please call 647-438-7772 to place your order.